Shortly after the death of Rev. Martin Luther King Jr., 50 years ago, the predecessor of OneUnited Bank, Unity Bank and Trust Company, was founded in Roxbury, Massachusetts. Today, we are the largest Black owned bank and first Black internet bank in the country. 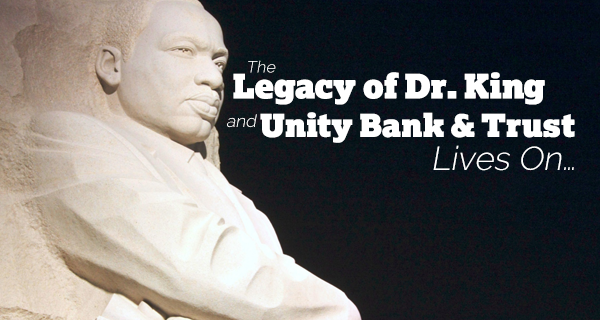 In honor of the late Dr. King, and his legacy and the visionary leaders who founded Unity Bank, we are inspired to reflect on our past and look to the future. Unity Bank was founded in 1968, at a time when there were 14,500 commercial banks in the U.S. of which only 20 were Black controlled. Established to give equal economic opportunity to the Black residents of Roxbury and Dorchester, Massachusetts, Unity Bank embarked on this journey with the slogan, “The Bank with a Purpose!” It provided free seminars on consumer education, investments, credit and how banking works. Unity Bank was conceived by John T. Hayden, a Black graduate of Harvard Business School and organized with the late Donald E. Sneed, Chairman and President, Marvin E. Gilmore, Vice President, and C. Bernard Fulp, Assistant Vice President and Chief Loan Officer. Mr. Fulp, who previously worked at two large banks in Boston and saw first-hand the discriminatory policies of banks including redlining stated, “Slum residents are eliminated solely on the basis of where they live. This drives those who can least afford it to finance companies and loan sharks who charge unreasonable interest.” Unity Bank was founded to change all of that. Over the past 50 years, the number of banks in the U.S. has declined from 14,500 to 6,700. Yet, OneUnited Bank continues the legacy of Unity Bank, including its mission to be “The Bank with a Purpose.” We became the first Black interstate bank, expanding beyond Boston by acquiring banks in Miami and Los Angeles. We received a designation as a Community Development Financial Institution (CDFI) by the U.S. Department of Treasury and loaned over $2 billion to communities that are over 70% or more minority and low to moderate income including Roxbury, Dorchester, Liberty City, South Central and Compton. We launched an internet bank in 2005 which allows us to bank anyone anywhere in the country with mobile banking and 30,000 surcharge free ATMs. We also built an exciting online community through social media. OneUnited Bank is “unapologetically Black.” We inspired and continue to promote the #BankBlack and #BuyBlack movements, encouraging the Black community to recognize the power of our $1.2 trillion in annual spending to build generational wealth. We are proud to provide leadership and contribute vital resources to the Black community in an effort to maximize the power of “collective economics.” We continue to focus on financial literacy and, importantly, advocate for economic and social justice including supporting #BlackLivesMatter. After 50 years, the legacy of Dr. Martin Luther King Jr. lives on through the legacy of Unity Bank and Trust and the current work of OneUnited Bank. We are honored to carry the torch…and recognize the importance of passing the baton to #MakeBlackHistory NOW. Thanks Gregory! We would love to have you join the OneUnited Bank Family and Community! All you have to do is start your Online Deposit Application today: https://www.oneunited.com/unity-checking/. Would like to join your bank but need to know where the banks are located. Hi Tonya, Yes you can definitely open a checking and savings account. You can simply go to: https://www.oneunited.com/unity-checking/. Here you can pick which checking account you would like to open and then add any additional accounts including savings account when you are on the Online Deposit Application form. Thank you for your commitment and the history lesson. Are you also a second chance bank? As a banker at One United,I am well pleased. Doing business is as good and better than most I have seen. I will continue to encourage others to get on board. Thank you for your service. Do you direct deposit your paycheck? If so, are the funds released as soon as the money is sent to the bank? I have been thinking about opening an account, I am touched by such powerful movement. I will becoming a member soon.God bless this bank even more. we truly appreciate your passion and desire for a local branch in your area. Currently, as part of our Bank For the Future initiative, we are focused on building our internet branch and online products so we can offer our great products and services on a national scale.But we are noting all the interest for local branches we receive so we can make informed decisions when the time comes to extend our branch footprint as well.Again, thank you for reaching out to us, and we hope you have a fantastic day!